Admittedly I’ve not been working much on Webconverger in the past couple of weeks. Sorry about that. However yesterday I started plugging away at a couple of things and this morning I have had a couple of business enquiries! Goes to show you’ve got to show some activity in the project otherwise people won’t contribute. I’ve been dragging my heels the last weeks as I am starting to realise a Webconverger image for each locale is too hard on my computing resources. So I am working on getting all the iceweasel-l10n-, myspell- etc. things in one CD. And dropping http://download.webconverger.com/i18n. Users will have to enter in locale definition in manually, else please purchase a customized CD. Ok, I’ve just released 2.26 which is now double the size with all the locales & dictionaries I could find crammed in there. Also I re-enabled printing. 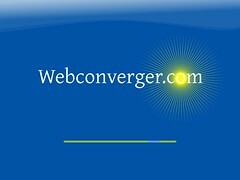 Download the Webconverger Web kiosk and tell me what you think. There is a Debian installer mode (for hard drive installs) I am experimenting with, so Webconverger will be less of a LiveCD/USB, and more of a “distribution”.